A nativity story for the very young child. Little Owl follows the Star, as do three men on camels and shepherds with their sheep. They soon find themselves part of the happiest scene on Earth. Have you met a child who doesn’t love Peppa Pig? That’s why I had to include this book on the list. Peppa makes a wish when she is making Christmas pudding with Granny Pig. Peppa’s wish comes true on Christmas morning when Santa realises he has forgotten to deliver Peppa’s gift through the night. Simply illustrated, this book tells the timeless story of the Christmas nativity. Jennifer Adams cleverly introduces babies to colours and to Charles Dickens with this bold concept book. This classic story is summarised by the use of single objects (e.g. black hat, silver chains, gold star), some well-known phrases and clever illustrations. Publisher: Usborne Publishing, June 2012. A bold sensory book for babies that will have them reaching out for Santa’s soft hat, sparkly sleigh and squashy boots. Join Maisy in celebrating the festive season, with this new edition of the bestselling novelty book. From wrapping presents and making the cake to putting up the shiny decorations and hanging up her stocking, Maisy’s preparations are bursting with excitement and colour and fun. Full of flaps to lift, tabs to pull and lots of sparkly surprises, this is the perfect mini stocking-filler for Maisy fans everywhere. Each page features a different Christmas object, which is named to encourage vocabulary building, and each illustration is full of Alison Jay’s trademark visual jokes and hidden links. In addition, a magical adventure unfolds wordlessly through the illustrations: two wakeful children creep downstairs on Christmas Eve, meet Father Christmas and are taken on an amazing adventure to his home in the North Pole and back again. Publisher’s description: Celebrate Christmas with a joyful new lift-the-flap board book – includes padded cloth Christmas tree on cover!, heartfelt rhymes and engaging illustrations. Publisher’s Description: Big Aunt Larlie is coming to stay and she’s brought her knitting needles and lots of balls of wool. She has already given Wibbly a scarf and some gloves and now Wibbly is worried that there is another tickly Christmas present on the way… A perfect tale of a small child’s anticipation of Christmas. 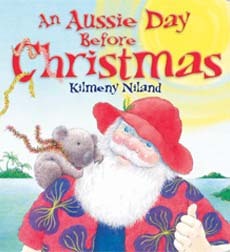 In this fun and colourful book children discover how Santa would prepare for Christmas Eve if he lived in Australia. He wears shorts and a singlet; eats a breakkie of snags, toast and honey; and he piles his sacks full of pressies into his old ute that is pulled by ‘roos. The fun-to-read-aloud rhyming verse has been especially adapted for younger readers. This is a funny Australian rendition of The Twelve Days of Christmas. All starts off quite romantic with a kookaburra up a gum tree, but with penguins licking ice-creams, flies hanging around mince pies and emus playing football it all becomes a bit of a ruckus. This will be a hit with kids that like a bit of silliness. Publisher’s Description: Read the rhyming text with your child and talk about what clues you can see in the pictures, and what you think the present is each time. Then lift the flaps to reveal just who the present belongs to! Lift the flaps and join Spot as he finds out about presents, Christmas trees and all the excitement. If you love Dear Zoo, you’re bound to love Dear Santa. Santa responds to a letter by sending a string of gifts. Children need to lift the flaps to find out what presents Santa is sending until they find one which is just right. Grug is getting ready for Christmas. Join him in his adventures. This is a classic and beautiful retelling of the Nativity story for young children in which an ox kindly welcomes animals, Joseph and Mary into his stable. The animals are there to welcome baby Jesus into the world later that night. Publisher’s Description: Hurray! It’s Christmas Day and Maisy is celebrating with all her friends. After some exciting present-opening, they sing a Christmas carol to Maisy’s new guitar and then sit down to a delicious feast. LOOKING FOR AUSSIE CHRISTMAS STORIES?